This set of Computer Graphics Questions and Answers for Entrance exams focuses on “Sutherland-Hodgeman Polygon Clipping”. 1. Sutherland-Hodgeman clipping is an example of_________________ algorithm. Explanation: The Sutherland–Hodgman algorithm is used for clipping polygons. Cohen- Sutherland is line clipping algorithm. 2. How many polygons are used in this method? Explanation: Two polygons are used in this algorithm namely clip polygon and subject polygon. 3. Only vertices from the subject polygon that are on the _______________ are selected. Explanation: Only vertices from the subject polygon which are on the visible side are selected and rest of the vertices are clipped. 4. The process is repeated iteratively for each clip polygon side, using the output list from one stage as the input list for the next. Explanation: The process is repeated iteratively for each clip polygon side, using the output list from one stage as the input list for the next. When the process is completed, a new polygon is generated. Explanation: We can correctly clip a polygon by processing the polygon boundary as a whole against each window edge which can be accomplished by processing all polygon vertices against each rectangle. 6. How many edges of the clipping are/is present in 2D? Explanation: If the algorithm is done in 2D, we have 4 edges of the clipping area. Left edge, right edge, top edge and bottom edge. 7. If we used Left->Right->Up->Bottom, the final output will be the vertex list outputted by the ___________ edge. Explanation: If we used Left->Right->Up->Bottom, the final output will be the vertex list outputted by the bottom edge. The final result is given by the last edge which is a bottom edge in this case. 8. If the subject polygon is concave at vertices outside the clipping polygon, the new polygon may have coincident edges. Explanation: If the subject polygon was concave at vertices outside the clipping polygon, the new polygon may have coincident edges. The result will be the same in case of overlapping edges too. 9. In a convex polygon, each of the interior angles is less than ____degrees. Explanation: A convex polygon is a simple polygon in which no line segment between two points on the boundary ever goes outside the polygon and interior angles are less than 180 degrees. 10. One of the drawbacks of Sutherland- Hodgeman algorithm is that it can’t produce ____________ areas. Explanation: The Sutherland-Hodgeman algorithm is not able to produce connected areas. For connected areas, Weiler-Atherton Algorithm is used. 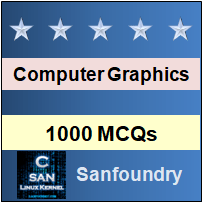 To practice all areas of Computer Graphics for Entrance exams, here is complete set of 1000+ Multiple Choice Questions and Answers.